Drum Werks XXVIII: Hard Rock offers infectious uptempo and fast rock drum loops. Perfect for tracks needing the high octane feel and power of John Bonham, Simon Phillips, Alex Van Halen, and Dave Grohl. Whether you need hard rock, classic rock or alt rock drum tracks, put these live studio drum loops to inspired use. Grooves sets ranging from 125 BPM to 180 BPM will deliver live, punchy, and powerful rock drums to your recordings. Hard-Rocking Drum Loops Inspired by Rock’s Biggest Hitters! Drum Werks XXVIII unleashes pure rocking power and energy to your rock drum tracks with an extensive and versatile library of rock drum grooves. Take beats inspired by Bonham, some Bun E Carlos style power pop, and a healthy dose of Dave Grohl alt-rock attitude and combine them in a cohesive collection of songwriting tools that will inspire your rock songwriting to new heights. Drum Werks XXVIII is all about rock drum loops that deliver the high-octane intensity and energy your drum tracks need. If you’re a fan of the drumming of John Bonham, Simon Phillips, Alex Van Halen, or Dave Grohl, Drum Werks XXVIII wil become a formidable source of rhythmic inspiration for your hard rock tracks. This is a powerful sample library inspired equally by classic rock drumming and modern rock styles. It’s all about big live rock drums on Drum Werks XXVIII. No beat detective. No sequenced “drumbeats.” No lo-fi garage recordings. If you want big, sweaty, balls-out rock and roll, then you’ve got it with this powerhouse collection of live drum loops. In a focused range of tempos covering 125 bpm through 180 bpm, Drum Werks XXVIII: High-Octane Rock offers powerful live drumming to cover hard rock and classic rock as well as alt, power-pop rock drum styles. Organized in tempo-specific ‘Groove Folders’ you’ll get all the rhythms you’ll need to create your next rock song: verse, chorus, bridge, fills, and more. If you can drag and drop audio loops, then you can create powerful rock drum tracks instantly with Drum Werks XXVIII: High-Octane Rock. And, because of our innovative “Single Session” sample library approach, you get a consistent drum sound across the entire collection of drum performances found on Drum Werks XVII. All drum loops will sit easily and seamlessly into your mixes – ideal if you’ll writing for a CD project that requires a consistent drum mix across multiple songs. What’s more is you’ll be able to mix Drum Werks XXVIII with any of the drums from the “L.A. Three” Series that also includes Drum Werks XXIV, Drum Werks XXV, Drum Werks XXVI, and Drum Werks XXVII. This is unmatched consistency across several gigabytes of versatile acoustic drum loops and drum samples. 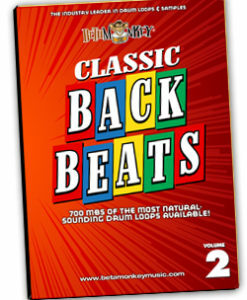 Tired of one-bar loops that don’t sound like a live drum track in your music? Drum Werks XXVIII: High-Octane Rock features longer loops (four and eight bars) to deliver rhythmic realism your music deserves. For those songwriters who want greater control over their tracks, Drum Werks XXVIII includes an extensive collection of matching cymbal and drum single hit samples. These samples will mix seamlessly with all drum loops on Drum Werks XVIII, allowing users to add accents with crash cymbals, kicks, tom, snares to the loops, an easy way to increase track variety and realism. For users using any of the major virtual instruments (Native Instruments Kontakt or Battery, Maschine, Logic ESX24 and other popular virtual instruments), you can easily create your own custom drum kits and create the exact drum track your music needs. Unlike other commercial releases, our included drum and cymbal samples weigh in at nearly 200 MB. The “L.A. Three” sessions are commercial release quality drum mixes and waiting to carry your next rock songwriting project. Acoustic and live, punchy and powerful, Drum Werks XXVIII is brimming with rock drums created from the timeless recipe of a great room, great drum kit, and great drummer. It really is that simple to getting great drum sounds and drum track performances. Stop settling for less. Get ready to take your music up a few notches with Drum Werks XXVIII: High-Octane Rock! Full Range of Rock Drum Styles: Delivering hard rock, classic rock and alt rock drum tracks, Drum Werks XXVIII is high-energy and uptempo live drum loops from one of L.A.’s go-to drum rooms. With tempos covering grooves from 125 BPM to 180 BPM, put the power of live rock drums to use as the foundation for rock drum tracks in all major DAWs. Superior Rhythmic Realism: No metronomic stiffness suffering from beat detective here. Big, live rock drum loops played by one of L.A.’s most in-demand studio drummers. Get the musical sensibility of true pro drummer with multiple platinum records to his name on your tracks. Longer Loops: Multiple 4 and 8 bar loops help you avoid the “sounds like a drum loop” syndrome. Without question, multi-bar loops produce more realistic drum tracks. Fully-Sampled Drum and Cymbal Samples: Customize the loops with over 200MB of multi-velocity drum samples recorded during the Drum Werks XXVIII sessions. Create new grooves or tweak existing ones, you call the shots. High-End Production: With Grammy Award-winning ears behind the desk and and a top pro behind the drum kit, Drum Werks XXVII delivers the “radio-ready” quality your music demands. Multi-Collection Compatibility: This collection is part of our “L.A. Three” Sessions – mix and match with any other collection from this studio session..
485 (644 GB 24-bit WAV and Apple Loops; 430 MB 16-bit WAV) original, license-free drum loops, samples in 16-bit, 24-bit WAV, APPLE LOOPS formats. 220 (207 MB 24-bit WAV; 137 MB 16-bit WAV) multi-velocity drum and cymbal samples. Instant Digital Download or DVD Format – ALL ACIDized WAV, APPLE, and REX2 formats included for download and/or for hard copy DVD purchases. These loops are a great tool for me. Brilliant building blocks for ideas. It’s quick and easy to construct a basic song framework which I can refine later. This helps me get ideas down with ease. I’ve been using Betamonkey loops for a few years now and I’ve always found these loops fun to use, and they sound awesome. Drum Werks XXIV: Slow 6-8 Drum Loops offers 600+ MB of versatile 6/8 drumming whether you need no-nonsense straight 8ths or shuffle feels. Get extensive coverage between 30 bpm and 60 bpm to inspire your songwriting with live 6/8 time drum loops. Like no other loop collection available - exclusively 6/8 grooves! 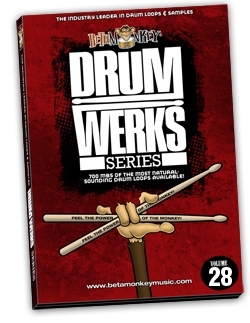 Drum Werks X: 100% Loud and Fast Drum Loops for Punk and Punk Rock. Ever get the feeling you've been cheated? 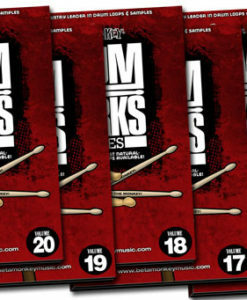 Drum Werks X is a complete songwriting package for aggressive music, featuring over 650 slamming punk drum loops. Whether you need straight-ahead 2's and 4's on the hats or ride or you need some aggressive tom patterns, Drum Werks X features punk beats from 100 BPM to 280 BPM. Complete drum samples included. Drum Werks I is all about one thing: hard-hitting and powerful classic rock drum loops and samples from start to finish. From spacious half-time feels and blues-rock stomps to mid-tempo classic rock and double bass riffing, Drum Werks I has the big rock sound and attitude loud electric guitars deserve.